The elite German paratroopers, who were some of the finest fighters in the service of the Third Reich, believed they were exceptionally well prepared to defend the deep water port of Brest on France’s Brittany coast against an impending attack by the Allies. By mid-September 1944, the Germans had had time to dig deep trenches, string thousands of miles of barbed wire, lay deadly mines, and establish interlocking fields of fire to ward off anyone foolish enough to approach by land. The centerpiece of the German defense was Fort Montbarey, an 18th-century French fort located just two miles west of the city’s walls. The fort’s stout masonry walls were coupled with a massive 40-foot earth embankment and a historic 40-foot-wide, 15-foot-deep moat. Enemy pillboxes and well-placed machinegun positions were located outside the fort, which was further protected by a 10-foot-deep, 13-foot-wide antitank ditch and a 200-foot-wide minefield laced with buried 300-pound naval shells with hair-trigger igniters that could easily obliterate any oncoming tanks. The U.S. Army Air Forces’ massive effort to use aerial bombing to shake the Germans’ resolve did little more than create a cratered terrain around the fort and further solidify the defenders’ determination to hold the fort at any cost. But the Nazis were not prepared for the determination of Major Tom Dallas, the newly appointed commander of the 1st Battalion, 116th Infantry Regiment of the U.S. Army and British soldiers of the 141st Regiment, Royal Armored Corps, with their 15 flame-throwing Crocodile tanks. The Crocodile was one part of an odd-looking British tank force nicknamed Hobart’s Funnies. The fighting began at 8 am on September 14, and the going was exceptionally slow as the American infantry moved forward against the well-entrenched Germans. The British and Americans worked well together, with the Americans clearing a mine-free path for the advancing tankers and providing the infantry to protect the tanks from concealed Germans equipped with lethal panzerfaust antitank weapons. 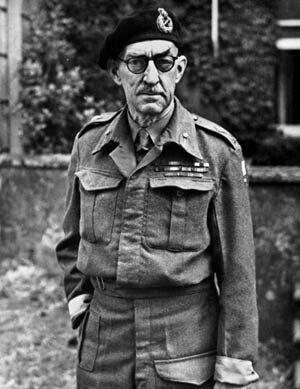 British armored expert Maj. Gen. Percy Hobart. By 4:45 pm, three Crocodiles under the command of British Lieutenant Hubert A. Ward had edged toward the minefield, backed by four conventional tanks to provide covering cannon fire. The Crocodile was a Churchill tank in which the hull machine gun had been replaced by a flame thrower. It was particularly effective against enemy-held bunkers and trenches. Each of the three Crocodile tanks towed an armored trailer with 400 gallons of flammable fuel that could be forced to the tank and projected as far as 120 yards in front and ignited by an electric spark. Suddenly there was a huge explosion as the second Crocodile struck a hidden naval shell, instantly killing the driver and blocking the way forward for the following tanks. Without hesitation, Ward directed his lead tank forward in a lone assault. The assault, though, would prove key to turning the tide of battle. As the Crocodile moved forward firing flame, stunned surrendering Germans began running out of the pillboxes outside of Montbarey’s thick walls. More than 75 terrified Germans surrendered to the U.S. infantry. Ward and his intrepid tank crew continued forward through the minefield, antitank ditch, and craters, creating a “burning track of death through the rich harvest of machine guns and light antiaircraft and antitank guns,” according to the unit’s postwar history. Fiercer fighting would be needed to take the port, but the British and their Crocodiles had helped win the day. Although ultimately used against German-held ports in other regions of France than Normandy, Hobart’s Funnies initially were developed to ensure successful landings at the five beaches in Normandy where the Allies came ashore on June 6, 1944. These beaches were protected not only by concrete bunkers housing a variety of guns, but also by beaches strewn with all manner of mines and steel obstacles. To address the multitude of enemy-constructed obstacles incorporated into the German shore defenses, the Royal Engineers were inspired and assisted by British armor expert Maj. Gen. Percy Hobart. Lt. Gen. Sir Archibald Wavell, commander of British forces in the Middle East, had forced Hobart into early retirement in December 1939 largely because of Hobart’s unconventional ideas about armored warfare. British Prime Minister Winston Churchill had Hobart reappointed in February 1941. The prime minister had a knack for spotting and tolerating those whose ideas differed from the mainstream. The fact that Hobart was British Field Marshal Bernard Montgomery’s brother-in-law was kept rather carefully concealed by both men, because each would have to sink or swim on his own without assistance from the other. An illness compelled Hobart to take a three-month hiatus from February 1942 to May 1942, but he was back at work by late spring. Hobart subsequently took command in October of the British 79th Armored Division. The division was about to be disbanded in early 1943, but Chief of the Imperial Staff Field Marshal Alan Brooke found a way to keep it together. Brooke renamed it the 79th Experimental Armored Division Royal Engineers. He tasked it with designing and testing prototypes of tanks modified in such a way as to help breach the Atlantic Wall when the Allies eventually opened up a second front in Western Europe by invading France. 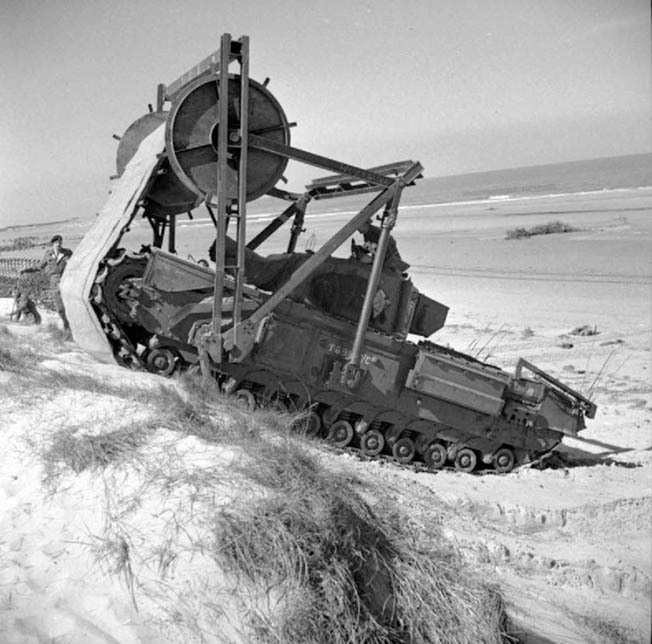 Hobart would build on the success of a design and testing effort known as Exercise Kruschen that took place in Suffolk in March 1943 in which British engineers working with other members of the British military had tested the efficacy of deploying sappers on specialized armored engineering vehicles. Under Hobart’s supervision, the training and equipping of the 79th Experimental Armored Division Royal Engineers was undertaken in East Anglia, Suffolk, and South Wales. In preparation for the beach assaults, the Allies had built facsimiles of the obstacles, which were based on analysis gleaned from reconnaissance photos of the German coastal defenses, and used them in dress rehearsals of landings undertaken at the training sites. The Sherman Crab featured a rotating cylinder with weighted chains designed to detonate mines for follow-on forces. Many of the ideas used by Hobart were not original. Some already had been conceived and tested with various degrees of success. But it was Hobart and his engineers who debugged the devices, for the most part, and made them usable on the battlefield against highly experienced and highly gunned, well dug-in German defenders. For example, the Scorpion, a modified Matilda tank, had been used with some success to clear minefields in North Africa while the Russians had adapted some of their T-34 tanks with mine rollers. Bridge layers and fascine carriers also had been used elsewhere, but it was Hobart and his engineering assistants who refined the technologies and brought together the largest and most elaborate collection of specialized equipment to assault the Atlantic Wall. Most of the retrofitting involved modifications to the British Churchill tank or the U.S. Sherman tank. Each had its advantages. 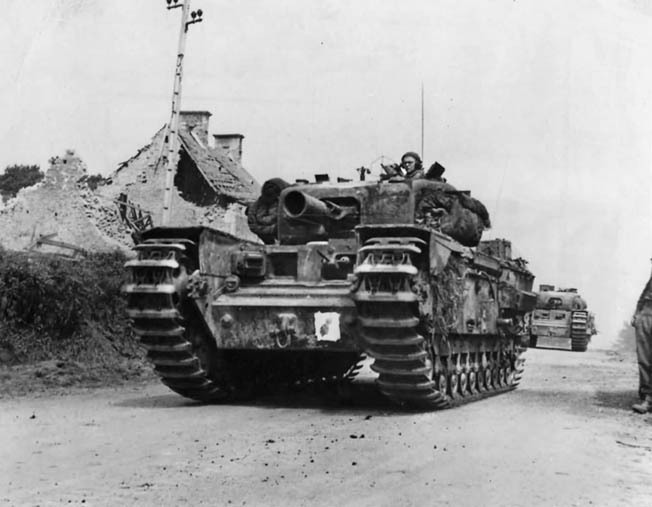 The Churchill had overall good performance traversing various kinds of terrain, and the Sherman was dependable because of its mechanical reliability. D-Day was the big coming out for Hobart’s Funnies. 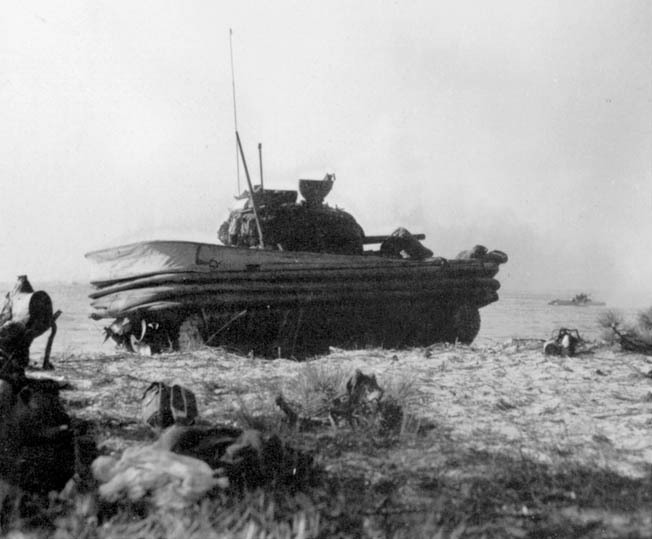 “It was the overwhelming mass of armor in the leading waves of the assault, the specialized equipment coming as a complete surprise, which overwhelmed and dismayed the defending troops and contributed in large part to the combination of strategic and tactical surprise which resulted in comparatively light casualties suffered by our troops on D-Day,” stated the 79th Division’s final report. For clearing mines, the Allies used modified Sherman tanks called Crabs. 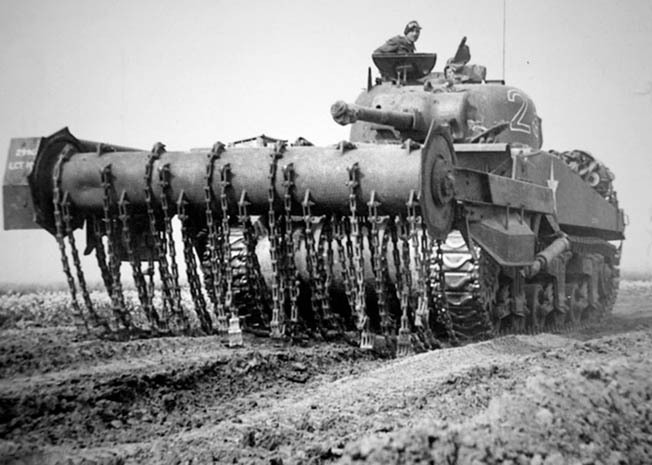 The Sherman tanks were outfitted with chain-and-ball flails that spun on a large drum mounted at the front of the vehicle. The Crab was a marked improvement over the earlier Scorpion, which was used with some success in North Africa. The Crab was a simplified version, using a direct drive shaft from the tank’s own engine rather than its predecessors’ more complex system that relied on two rather unreliable auxiliary motors to spin the drum. The Churchill AVRE Fury featured a petard mortar that fired a 40-pound projectile intended for use against concrete bunkers and roadblocks. The Crab retained the Sherman’s 75mm main gun, enabling the vehicle to double as a gun platform. When flailing, the turret was turned so the main gun was facing toward the back to prevent damage from exploding mines. There was still room for improvement, as the Allies discovered, because on uneven ground the boom tended to rise, causing the flails to miss the ground and leading to deadly results for some unfortunate tank crews. Still, the Crab was a substantial improvement over both the Scorpion and hand-clearing. Crab crews were able to clear a nine-foot-wide path at upward of 1.5 miles per hour over reasonably level land. The largest and most diversified category of Hobart’s Funnies was the Armored Vehicle Royal Engineers, or ARVE. The AVRE was not actually a British invention but a Canadian one. It was the brainchild of Lieutenant John James Denovan of the Royal Canadian Engineers. Denovan, who had been a civilian engineer before the war, was assigned to the British Army Department of Tank Design. Denovan had lost a number of friends in the disastrous August 1942 Dieppe raid when the Canadian tanks bogged down on the sand and shingle of the beaches. That prompted Denovan and others in the Canadian ranks to look for more efficient ways to get tanks off a landing beach to bring them to bear against hardened, prepared German positions. Denovan and his colleagues prepared a report for the War Ministry in which they stated their desire to develop devices that would enable Allied tank crews to surmount obstacles without having to expose themselves to enemy fire in the process. The Crocodile’s flamethrower was connected to an armored trailer that carried 400 gallons of flammable fuel. Subsequently, Denovan and other engineers identified a variety of tasks they wished the devices to accomplish, such as carving a safe path through a minefield, crossing antitank ditches, demolishing obstacles with explosives, destroying bent rail obstacles, and laying mines under fire. One of the devices Denovan explored during the subsequent testing period was the Blacker Bombard, invented by Latham V.S. Bombard, a retired British Army lieutenant colonel. He initially developed the bombard early in the war as a spigot mortar to be used as an antitank weapon. It was a large and heavy weapon, weighing in at 300 pounds, that used black powder to propel either a 14-pound high explosive or 19.5-pound armor-piercing round 450 yards, with an effective range of 100 yards. Within a few weeks, Denovan and his crew had modified the weapon so it was capable of accurately firing a shell filled with 29 pounds of high explosives up to 80 yards. Testing proved that the mounted mortar, which was called a petard after the French explosive device of the 16th century, could destroy reinforced concrete structures. The device was given the go-ahead as a replacement for the Churchill’s main gun on selective tanks. The AVRE was designed to carry a variety of equipment needed to span obstacles or remove them from the path of follow-on forces. AVREs were designed to handle a variety of missions, including laying carpets across obstacles, deploying assault bridges, filling in ditches with fascines, recovering vehicles, and plowing mines. One of the better known of Hobart’s Funnies was the carpet-laying device known as a bobbin. The initial nine-foot-wide canvas carpet unrolled in front of the advancing tank from a horizontal roller mounted in front on twin arms. Later the mat was replaced by an 11-foot-wide, 100-foot long canvas reinforced by wire and chestnut saplings, developed for foot and light vehicle traffic. Once the D-Day landing sites were firmed up by the planners, aerial reconnaissance revealed that blue clay on some of the beaches would bog down vehicles. Consequently, modifications were made and a heavier mat reinforced with steel shuttering was used, and the carpet was extended to nearly 350 feet in some cases. Most of the retrofitting involved modifications to the British Churchill tank or to the U.S. Sherman tank. The Sherman amphibious tank outfitted with a watertight canvas housing was designed to float to shore from a landing craft at sea. Heavy seas on D-Day caused a number of these tanks to sink, drowning their crews. The AVREs also could be equipped to carry what the British called a Box Girder, basically a 34-foot-long assault bridge mounted on the front of the tank. It could span a 30-foot gap and support a 40-ton load, sufficient to carry any of the vehicles used on D-Day, including a Churchill tank or another AVRE. The more complicated armored ramp carrier was a turretless Churchill tank with ramps at each end so that other tanks could move up the ramp, over the tank, and down the other ramp to proceed onward. One of the simpler devices was the fascine carrier, consisting of a cradle on front of an AVRE to carry a eight-foot-diameter bundle of 11-foot-long saplings that could be released to fill ditches or trenches so the advancing tanks could cross. The Bullshorn Plow consisted of a plow that cleared the area in front of each track and could be used over irregular, crater-filled terrain to clear crucial areas of land mines that might be missed by the flailing Crabs. The AVRE also served as a platform for various other miscellaneous devices and applications. One of these was the twin Bangalore torpedo. This application involved outfitting the front of an ARVE with a light framework that allowed the twin torpedoes to be placed and fired by soldiers who were protected by the vehicle. Another was known as the Porpoise. It was a waterproof sledge towed by an ARVE designed to keep additional demolition and ammunition stores dry while being transported. The Churchill ARVE Bobbin featured a 10-foot-wide canvas cloth reinforced with steel poles that unrolled onto the ground. The canvas offered traction over the soft sand of the invasion beaches. Omaha Beach did not have the benefit of AVREs. The Americans, admittedly, had not warmed to the idea of using AVREs that were based largely on British-designed tanks. That would have entailed a distinct, late-in-the-planning learning curve for the American tankers. Also, it would have necessitated initiating another redundant stream of replacement parts and supplies for the non-Sherman tanks. The Americans were not opposed to innovation, and they did accept and use the dual-drive swimming Shermans. After the Normandy landings, the Allies employed Hobart’s Funnies in other key parts of the liberation of German-occupied Western Europe, such as the capture in September 1944 of heavily fortified port cities such as Le Havre, Boulogne, and Calais, and other key coastal operations such as the opening of the Scheldt River in the Low Countries. But ultimately it was the overall quantity of Allied war matériel, coupled with the valiant men, that made the real difference throughout the long and bloody war. It was the combination of war matériel and the brains, brawn, and sheer determination of those involved that made the difference in how the AVREs and related implements of war were used to force the Nazis back toward Berlin and eventual capitulation.